Stumped on how to play Santa to your kids this year? 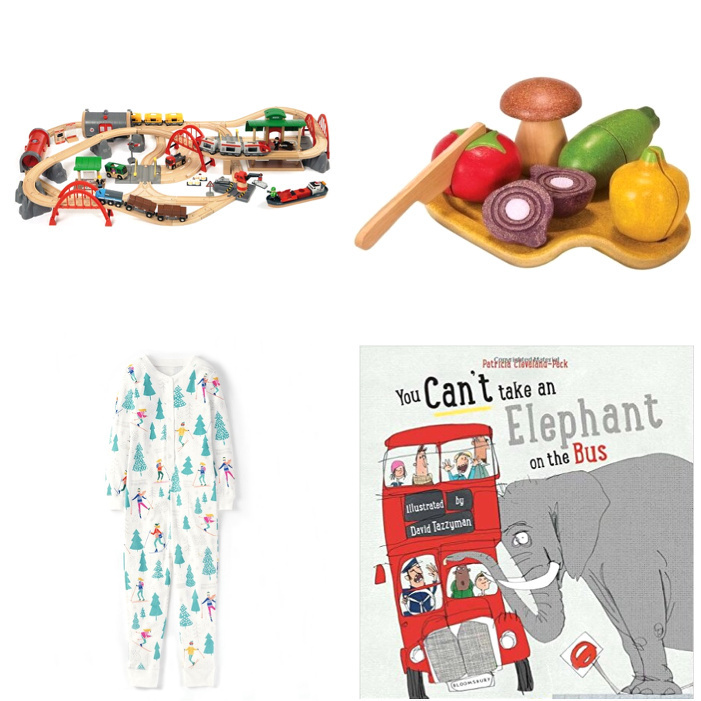 Our Lifestyles Editor, Hadley, scoured her favorite baby shops and polled fellow mamas to find the perfect gifts for your little ones, from newborns to grammar school kids. We’ve got brightly colored gadgets to soft, cozy clothes—nothing loud, blinking or plastic in sight. Most everything is sourced in Europe and the few items that aren’t can be easily (and inexpensively) shipped. Oeuf is my my go-to brand for beautiful, stylish clothes. I’ve fallen in love with their baby animal hats, which keep your little one cozy while making them even cuter! Available in sheep, deer, kitten, dalmatian and other animals. 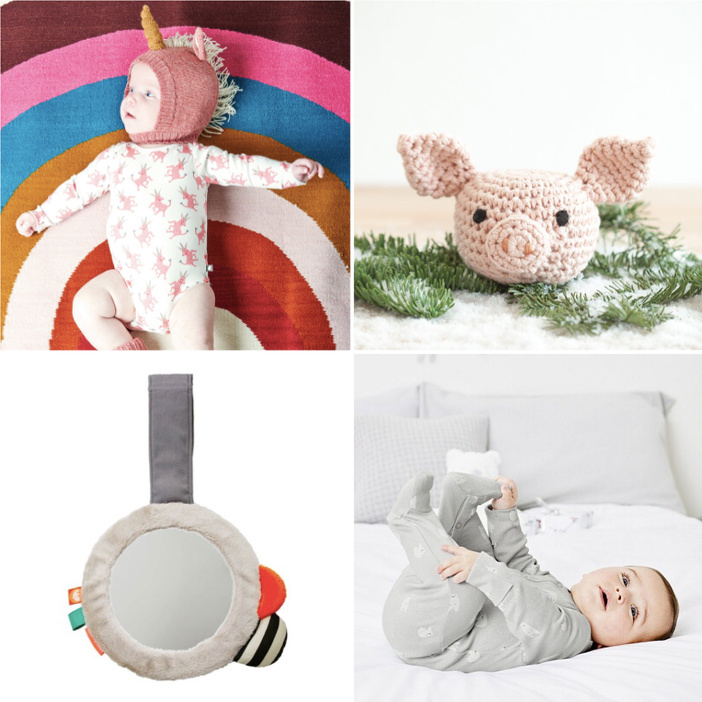 Delight your baby with a rattle handmade in Germany from organic wool. My favorites are the pig(above, right) and the fox. Mirror mirror on the wall, who’s the fairest of them all? Help your little one ponder the important things in life (and hang out longer in his crib!) with this brightly-colored mirror. While I adore French pyjamas, I find myself drawn to the Brits when it comes to holiday-themed nightwear. This sweet polar bear print from The White Company is delicate and festive. Keep your babe cozy with organic cotton leggings from the newly-launched Dutch boutique Adam + de Kleine wolf. Every French baby deserves a croissant, especially one that’s made for tender gums. LexyPexy’s “eco-chic” teethers are made with love (and a knowing wink) in NYC. Also available as a Céline bag, green juice, and more. Nearly every parent I asked recommended Lamaze toys, which are designed to awaken your baby’s senses. The universal favorite seems to be Rusty Le Robot. 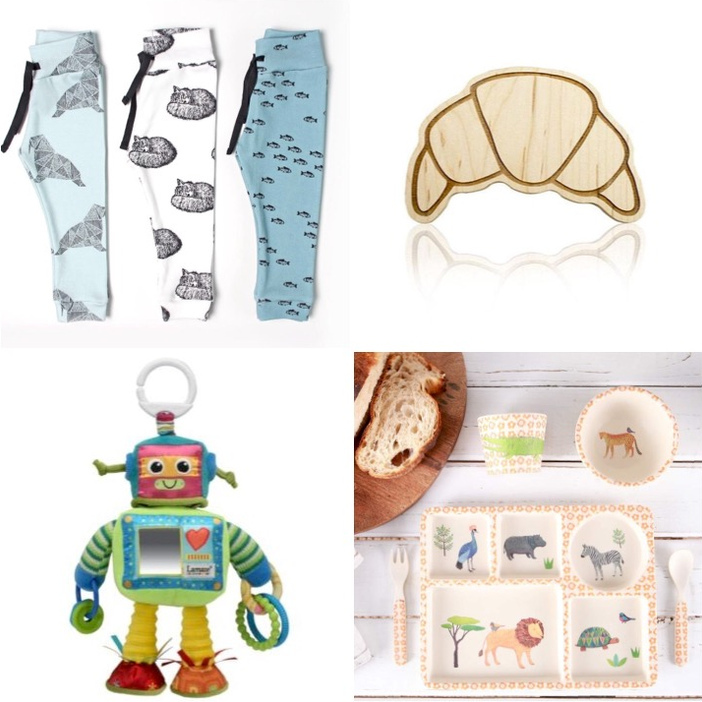 Get ready for your little one’s first bites with this adorable safari bamboo dishware set by Love Maé. It will make mealtime more fun for everyone. My son went crazy for these animal blocks , which can be used to build or make different sounds. Now that he’s older, he still likes to build animal towers. 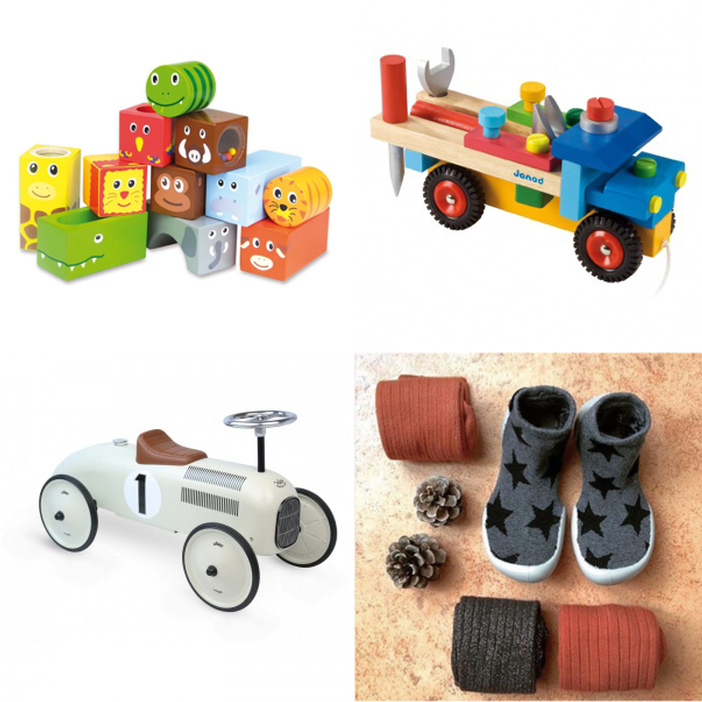 For toddlers who love to put things together, this bricolage truck is chock-full of tools to explore. Guaranteed to keep her busy for hours! Your tot will absolutely love scooting around in Vilac’s ride-on car. Vroom vroom! Keep his toes warm with Collegian slippers, made in France and available in a wide range of adorable colors and patterns. They come in adult sizes, so get yourself a matching pair for cuteness overload. I love Brio’s train sets, which are available in every configuration imaginable. Customize your toddler’s dream track and sit back while she plays for hours. For better or for worse, toddlers love imitating adults. My son adores “cooking” alongside me with these eco-friendly wooden veggies that he can chop with the included kid-friendly knife. Wake up on Christmas morning ready to unwrap gifts in style. I’m obsessed with this sweet winter-themed print from Boden. We discovered this terrific book while visiting London two years ago and, to this day, it’s a family favorite. 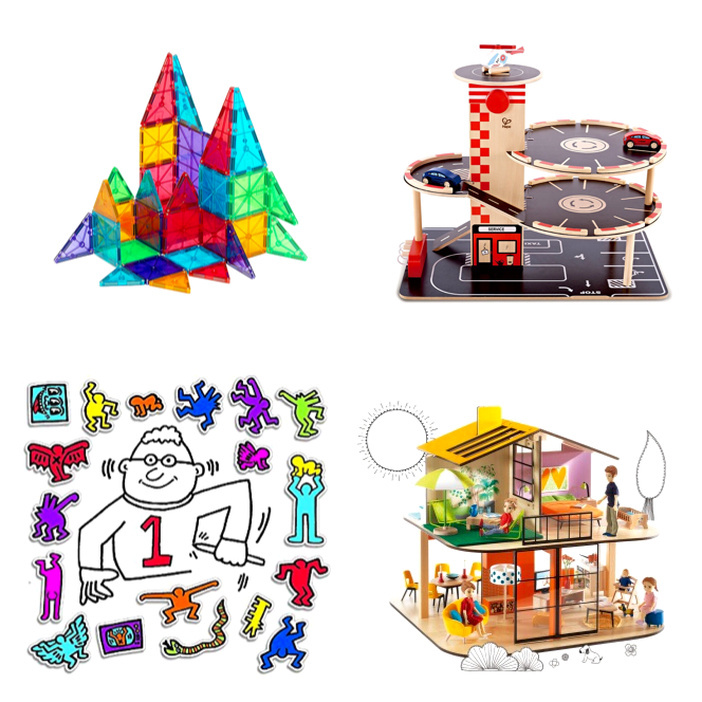 The hottest toys in recent years are magnetic blocks from Tegu and Magna-Tiles (above, left). Kids love them and moms swear by them. My little guy received a set during our recent visit to the U.S. and it was a godsend during the 4am jetlag-induced wake-ups. Introduce art from an early age with these colorful magnets featuring Keith Haring images. What’s better than entertainment that’s also culturally enriching? Djeco’s Color House is perfect to encourage your son or daughter’s imagination. It can be accessorized to your heart’s content and is gender neutral! Who doesn’t love a good labyrinth? The friend who recommended this said she spends nearly as much time playing with this as her daughter. Teach your child (and yourself) all about France—every. single. département—with this fun puzzle. Perfect for the long, cold winter months. Your kid can build his own City of Light! Made from recycled cardboard, this is a fun craft project and can later serve as artwork for his room. Have you gotten your kids their gifts yet? Tell us here or on Facebook, Instagram and Twitter. 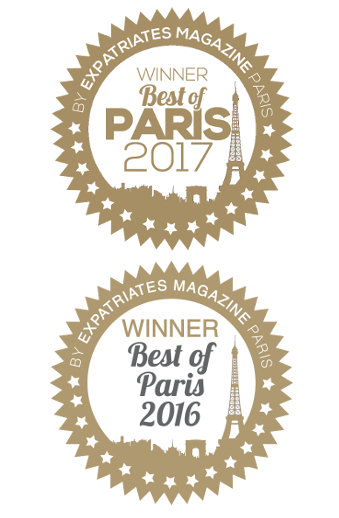 And please sign up for our newsletter to get the freshest goods from Paris. 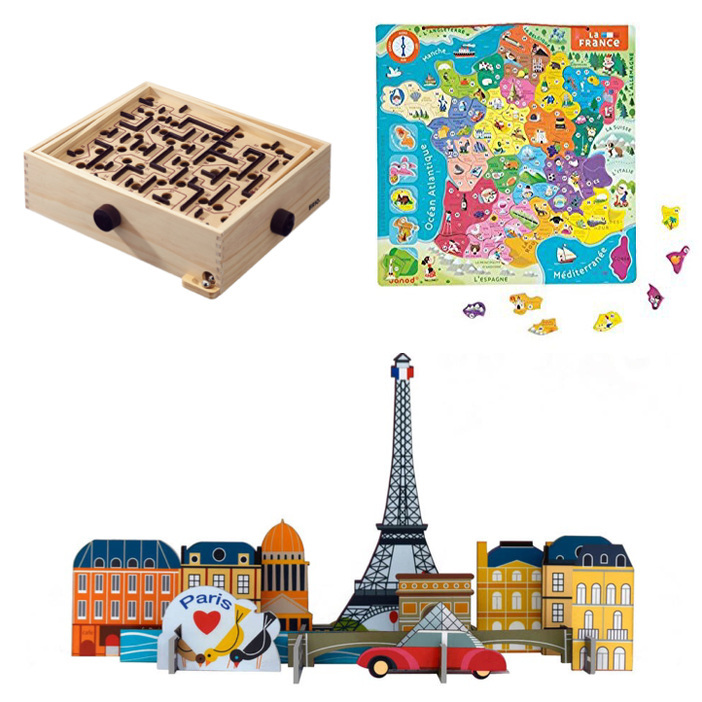 If you’re looking for gifts for everyone else on your list, check out our Timeless French Gift Guide. Next Article How Do You Say “Private Parts” In French? 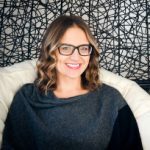 Hadley Seward is a certified sleep consultant and American mama living in France. Meet her at Bonne Nuit Baby or follow her adventures at @_bonnenuitbaby.